U.S. markets were up again last week, as major domestic indexes posted their 4th weekly gains in a row. In fact, the S&P 500 was no longer in correction territory at Friday’s close—and was in the middle of its best yearly start since 1987. For the week, the S&P 500 gained 2.87%, the Dow added 2.96%, and the NASDAQ increased by 2.66%. 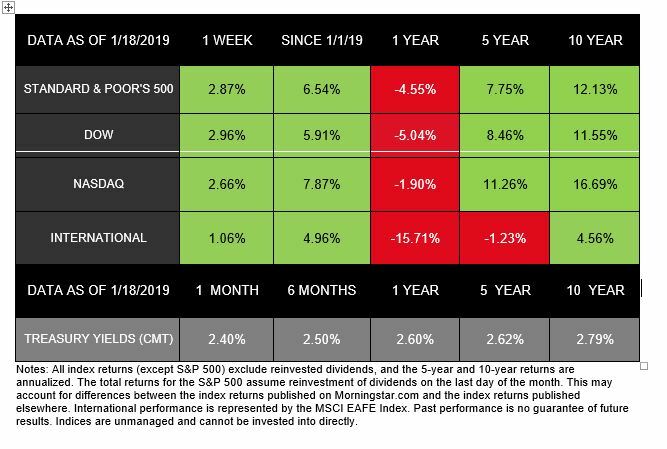 So far, all three indexes are up more than 5% in 2019. Internationally, the MSCI EAFE also ended the week in positive territory, posting a 1.06% gain. What is driving the rally? Once again, developments in our ongoing trade negotiations with China contributed to the performance. On Thursday, a report emerged that the U.S. was weighing whether to lift tariffs on Chinese imports. However, the Treasury Department said Secretary Steve Mnuchin had not recommended this action. Then, on Friday, Bloomberg released news that China may raise its imports to a level that would close the trade deficit by 2024. This potential sign of progress contributed to the day’s market gains. So far, 11% of S&P 500 companies have released their earnings reports for the 4th quarter of 2018. As expected, growth is not as fast as in the last year’s previous quarters, but total earnings are still up 16.9% over the same period in 2017. We are very early in earnings season but anticipate data from another 56 companies coming out this week. The latest consumer sentiment reading fell to its lowest level since 2016, yet it still remains relatively high. This decline could signal that the current impasse over border-wall funding and the volatile markets are negatively affecting the economy. The latest data showed that U.S. manufacturing output increased by 1.1% in December. This rate exceeded expectations and may help calm concerns that factory production is slowing. Since December 22, parts of the Federal government have been closed, marking the longest shutdown in U.S. history. Economists estimate that each week the shutdown continues could reduce our quarterly growth of Gross Domestic Product by up to 0.2%. Looking ahead, we will not only have earnings data to consider in this shortened trading week, but also information on home sales and durable goods orders. We’ll continue to monitor economic reports—and geopolitical developments—as we support each client’s long-term goals. As always, if you have questions or concerns, we’re here for you.